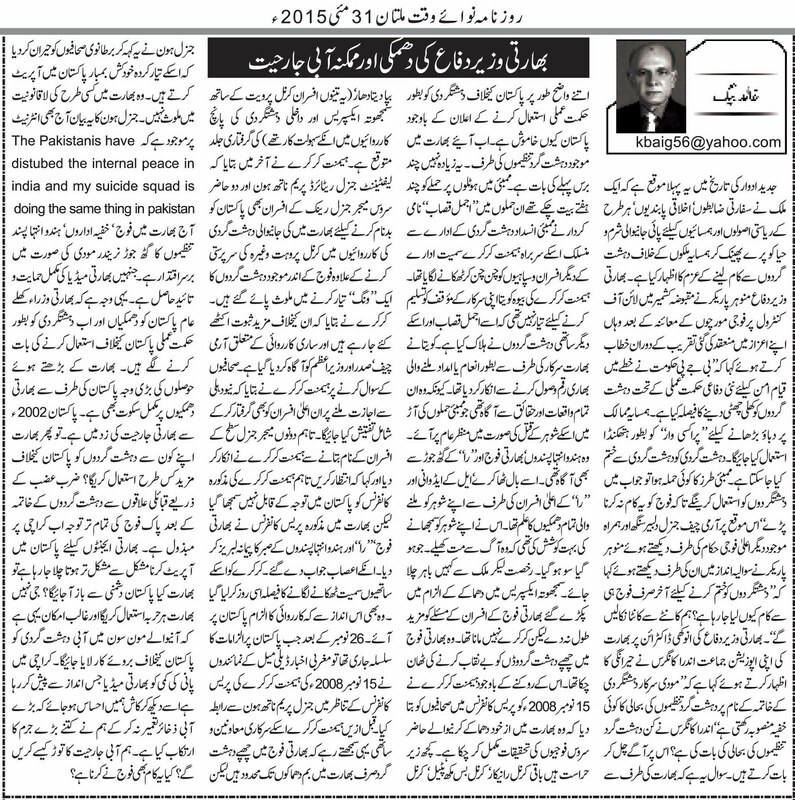 Truth by Kbaig: Threats by Indian Foreign Minister and Expected Water Aggression! 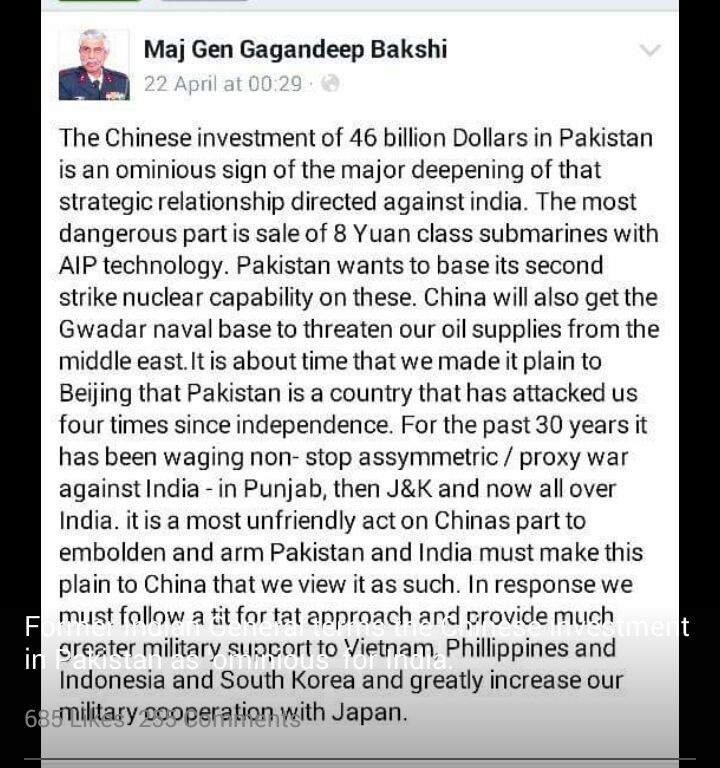 Threats by Indian Foreign Minister and Expected Water Aggression! This is the first event in the so called modern world that a country ignores international law diplomatic and moral values and expresses the decisiveness to not only continue but increase terrorist activities against the neighbor country. 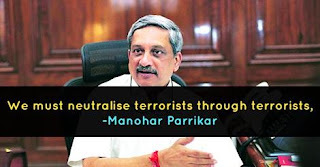 During his visit to Indian army posts over Line of Control in Indian Held Kashmir, Indian Defence Minister, Manohar Parrikar said that “BJP has chalked out new policy to support terrorism across LoC and use terrorists for proxy war. If Mumbai like incident is repeated India will use terrorists in spite of Indian army. Terrorism is the only way to end terrorism”. He looked towards Indian army Chief and other Senior army officers that why only Indian army is used to curb terrorism; why not use the terrorists to tackle terrorism? This strange extremist Hindu doctrine has been criticized by Indian Congress party as well that Modi establishment wants to restore Hindu terrorist organizations and wings in the name of tackling terrorism. 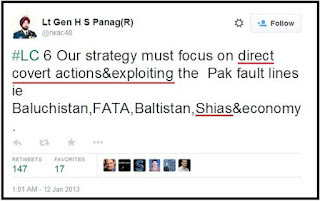 What terrorist organizations or wings have been pointed out by Congress; will discuss this late. 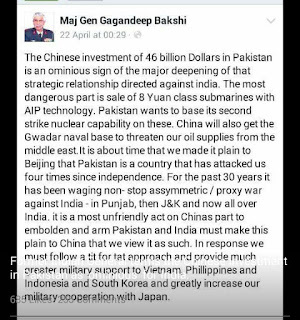 Here the most question is that why Pakistan is silent despite of such a clear declaration of terrorist war against Pakistan by India? Now lets come towards the Indian state terrorist organizations or wings; this happened few years ago. A fictitious character namely “Ajmal Qasab” killed important members of Mumbai Anti-Terrorist Squad including its Chief Hemant Karkare. Wife of Hemant Karkare is not ready to acknowledge Indian state stance that Karkare was killed by Ajmal Qasab and his accomplices. She also rejected prize money or aid given to her by the Indian govt. because she was well aware of all the circumstances and bitter realities that resulted in the death of her husband. She was also well aware of the nexus between Hindu (extremists) terrorists and RAW. She also knew that her husband had received life threats by senior RAW officials, L.K Advani and Bal Thakray. She tried her best to make her husband understand that he should not play with fire; whatever had to be done is done now he should go abroad on leave. She advised him not to further the investigations in the Samjhota Express bomb blasts especially the issue of involvement of an Indian army officer but Karkare did not pay any heed to her advice. He had decided to unveil the terrorists hidden within the Indian army. Despite of all the threats and advices he told journalists in a press conference on 15 November 2008 that he has completed the investigations regarding involvement of on duty Indian army officers in terrorism within India; some of them have been arrested, while rest of them Col Ranikar, Col Patel, Col Bipaditadhar (these three Colonels were accomplices of Col Purohit in the Samjhota Express and other terrorist activities within India) are expected to be arrested soon. He further disclosed that including Lt General (R) Primnath Hoon and two on duty Major Generals of Indian army have been found involved in terrorist activities within India to defame Pakistan and have established a secret wing within India to fulfill their ulterior motives. As a result of the nexus between Indian army and extremist Hindu organizations, Modi has came into power. He has the unconditional support of Indian Media as well. 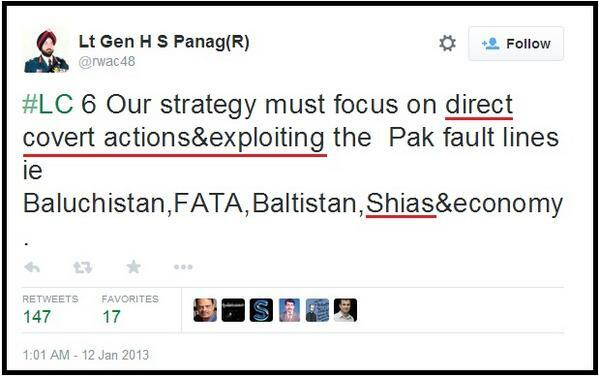 These are the reasons that Indian Ministers have got bold enough to threaten Pakistan with their terrorist plans. The reason behind this increased boldness is the silence from Pakistani side over Indian threats and state terrorism. Pakistan is facing Indian water aggression since 2002 and Indian terrorists are already active in Pakistan through its consulates in Afghanistan so what next terrorists will be used by India against Pakistan? After success Operation Zarb-e-Azb and destroying strong holds of Indian sponsored terrorists in Northern Areas, Pakistan army is now focusing on Karachi due to which it is becoming difficult for Indian terrorists and RAW agents to operate in Pakistan but will this abscond India from terrorism in Pakistan? No! Hindu India will never give up its enmity against Islamic Pakistan and will no stone unturned; expected attack might be using water stored in Indian dams as ‘Water Bomb’ against Pakistan in Monsoon season. In the way Indian media is giving coverage to shortage of drinking water we should realize that what criminal acts we have done and are still doing by not building the big water reservoirs. How will we tackle Indian water aggression? Is that also to be done by Pak Army?? ?